Instigated by a chance Charing Cross Road encounter with this striking Bridget Riley book, Theo Inglis considers the use of 'tall type' and seeks out other striking examples using typefaces which have been ‘Ultra-condensed’. The Empire State Building, so the story goes, gained its distinctive spire in a last ditch effort to win the race become the world’s tallest building. Leaving it over 200 feet taller than its near neighbour and rival, the Chrysler building, which only managed to hold the title for eleven months of 1930-31. From the competing giants of industry in early 20th century Manhattan, to the perpetual vertical one-upmanship of contemporary oil rich nations, architects have often been pressured to go bigger with their designs, ever taller up into the sky. In graphic design however, bigger often isn’t thought of as better. ‘Make the logo bigger’ being the ubiquitous phrase designers use to poke fun at the poor judgement of their clients. ‘Less is more’ being another oft-repeated phrase. Subtlety and delicacy are usually preferred to in-your-face brashness. When it comes to book covers, creativity is sometimes stifled by the need for a gigantic name dominating the available space. Imagine my surprise then, when wrenching a thin art catalogue out from an overstuffed shelf in a Charing Cross Road basement, I discover an incredible cover. One which is nothing but name. 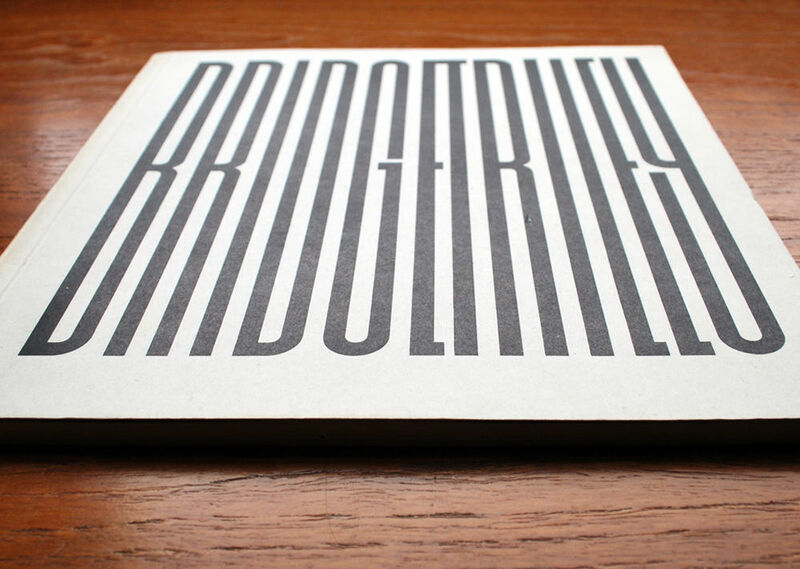 It took me a moment to figure this out though, BRIDGET RILEY spelt out in big letters. In fact, I should really say tall, despite the book’s small square format. The extremely thin black on white type causes a similar optical and headache causing effect to Riley’s own works of art. 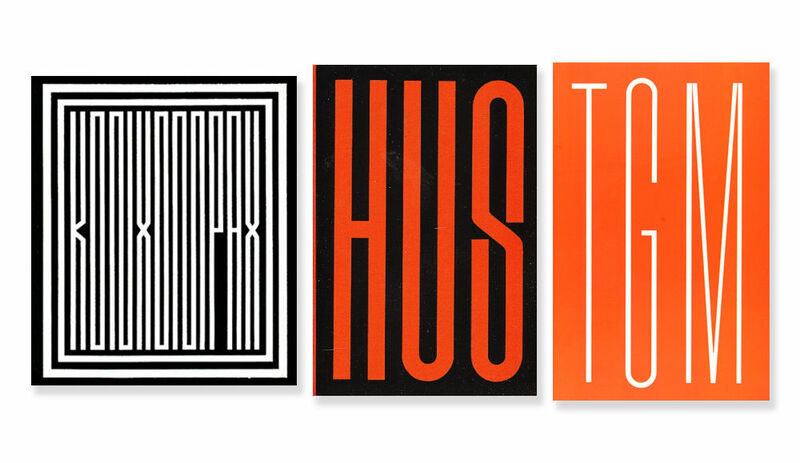 Making this both a visually distinctive and conceptually strong piece of typography. Sadly, all I can tell you about the designer is a name – Michael Lauder – as too often happens, there seems to be no information or other examples of his work online. It is possible that he worked for the company Lund Humphries, who designed the interior and printed the catalogue. Which was published to accompany an Arts Council exhibition of Riley’s paintings and drawings at the Hayward Gallery in 1971. Although there are now many digital typefaces which are almost identical in form and height to the letters on this cover, I suspect that Michael Lauder drew them himself for this specific purpose. It was pure serendipity that Bridget Riley happened to have a fairly short name, but not too short to ruin the effect. A font this tall and thin, is in reality very impractical and barely legible. Yet tallness, or to finally use the correct typographic term, condensation, has its uses. For all the talk of ‘Less is more’, sometimes filling as much of the available space can have an incredible impact, a brute simplicity. The origins of this ultra condensation in the Latin alphabet using world, can be found shortly after the birth of the sans-serif typeface in the 19th century. Serifs were themselves a barrier to the tight (but not touching) kerning and lack of width that tallness requires to achieve its purpose. With the explosion in poster printing and the need to be eye catching in an increasingly competitive market, it suddenly became hugely beneficial to have certain words as big as possible, yet not broken up, and voila the ultra-condensed font was born. Since finding the Riley catalogue I’ve kept my eyes out for other similar historical examples, and found that they are rare but always memorable. One is Konx om Pax by the occultist, mountaineer and “wickedest man in the world” Aleister Crowley, who supposedly designed the cover himself in 1907 “while stoned on hashish”. Another is the great Ladislav Sutnar’s 1933 cover for a book of writings by the Czech philosopher Jan Hus. Sutnar was clearly a lover of tall typography throughout his career, and 27 years after HUS he pulled off the same trick for another Czech thinker, T.G. Masaryk, this time having to settle for the initials TGM. I’m not sure if tall typography is a bit of a guilty pleasure for me, since in my own design work I often have to fight off the slightly amateurish instinct to make everything as big as possible and to fill all the white space. But I don’t think I’m alone in finding an occasional appeal in the unsubtlety. Perhaps I’m just noticing it more, but I can’t help but think tall typography has had a bit of a moment in recent years. Druk, the popular typeface designed in 2014/15 by Berton Hasebe for Commercial Type has some extremely condensed fonts within the family. Stefan Kjartansson designed Cinderblock in 2015, calling it “the World’s Tallest Typeface.”, its 400 weight being about as extreme as you could possibly want to go. 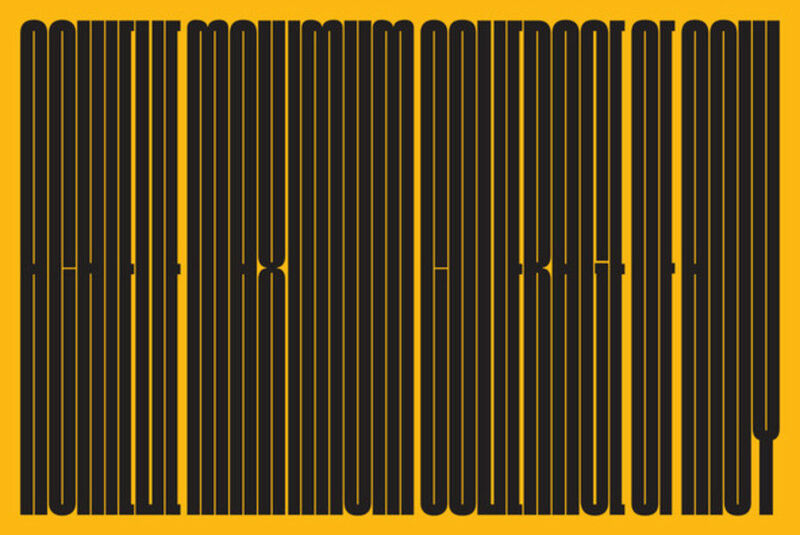 While this summer the New York Times Magazine ran a ‘High Life’ issue celebrating the height of the city, turning the magazine portrait and using a custom and very vertical typeface by Matt Willey. …published many illustrated monographs of artists such as Bridget Riley, Ben Nicholson and Barbara Hepworth, but it was also responsible for publishing the Penrose Annual from 1895, until it ceased publication in 1982. The hugely influential and very collectible London-based review of graphic arts was edited by Herbert Spencer from 1964-1973 – Spencer put his modernist stamp on the Penrose Annual, successfully bringing together the printing and craft aspects of the graphic design industry at the time.